Background: Substantial number of patients with paucibacillary leprosy may still have active skin lesions at the end of MD treatment because of the continuing immune responses, though this does not denote failure of treatment. A clinical trial was conducted to compare efficacy of a homoeopathic medicine with MDT for the cure of leprosy. Aim: To compare the effect of a homoeopathic medicine - Sulphur with the Multi drug in the treatment of Paucibacillary leprosy according to WHO guidelines. Materials and Methods: Out of total 90 patients enlisted, 60 confirmed Borderline Tuberculoid (BT) leprosy patients of the age 14 years to less than 60 years were registered under this trial. All the patients were allotted a precoded number, randomly and equally divided in two groups. One group was treated with Sulphur in 200 potency in liquid orally once in week for two years and the other group received Paucibacillary (PB) regimen as recommended by WHO. At the end of two years findings were corroborated. 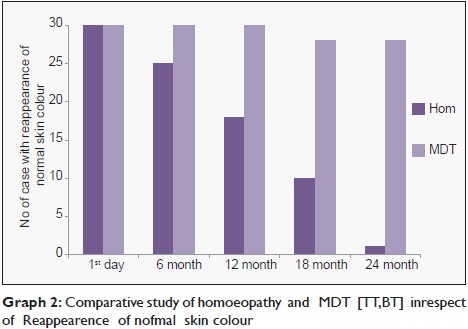 Results: The study showed that MDT therapy (PB regimen) and homoeopathic medicine were found equally effective as histopathology of skin showed no granulomatous lesion. The most significant clinical sign observed in all cases treated with Sulphur was reappearance of normal skin colour and regain of loss of sensation of the skin lesion. Conclusions: MD therapy (PB regimen) and homoeopathic medicine were found equally effective. The patients of paucibacillary leprosy could get rid of the skin symptoms if treatment with Sulphur (is also given with MDT). Leprosy is a chronic granulomatous disease caused by the bacillus Mycobacterium leprae which is still endemic in various parts of the world. It primarily affects the skin and peripheral nerves. Clinical presentation depends on the patient's immune status at the time of infection and during the course of the disease. Due to the implementation of Multidrug Therapy (MDT), the prevalence of the disease has remarkably gone down. Incidence refers to the number of newly detected case in the same period and population (1). Despite an efficient MDT coverage, new case detection rate remains at 4.41 per 10,000 as revealed from a survey conducted in year 2009 in selected endemic districts of two states. Despite an efficient MDT coverage, new case detection rate remains at 4.41/10,000 as revealed from a survey conducted in the year 2009 in selected endemic districts of two states. However, National Leprosy Eradication Programme report revealed that the new case detection rate has declined further as shown 9.98/100,000 in 2013-14. ,, and a significant percent of these are children. ,,, After completion of MDT for 6 month in paucibacillary (PB) leprosy and 1 year in multibacillary (MB) leprosy, clinically most of the patients do not feel cured because of the existence of the symptoms of lesion for a long time. Further viable M. leprae have been convincingly detected from such lesions after completion of MDT. , Due to this therapy persisters may get an opportunity for relapse , and resistant organisms may propagate slowly to infect a host with the primary resistant organism. , Studies from India and Mali showed that patients with a very high initial bacterial load (bacterial index more than 4+ on skin smear) have higher relapse rates (4-7/100 person years) and these relapses may occur late (averaging 5 years after treatment). Therefore, all these factors might be playing an important role in the efficacy reduction of incidence rate in endemic population in India. In leprosy, the peripheral neuropathy is caused by the M. leprae and its accompanying immunologic events. The course and sequelae of the immunologic events often extend many years, may continue long after effective antimicrobial treatment and may have severely debilitating physical, social, and psychological consequences. The immune system of the host gets adversely affected, and available drugs do not promote a symptomatic recovery. A clinical trial was undertaken to prove and compare the efficacy of homoeopathic medicine with MDT for the cure of leprosy. In compliance with the WHO guideline on clinical research trial, this trial was registered with Clinical Trial Registry - India (www.ctri.nic.in), Registration No. CTRI/2008/091/000080 Dated - 25.11.2008. This project was approved by the IEC of this Institute and subsequently by the Ministry of Health and Family Welfare, Government of India. Informed written consent was obtained from all the participants included in this study. 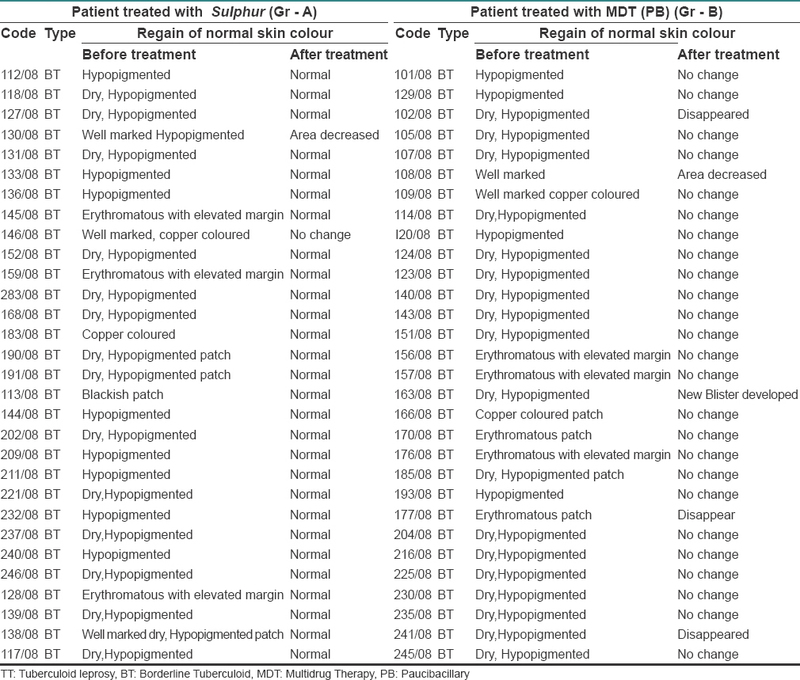 A total of 90 patients reported with hypopigmented and hypoesthetic skin lesion with or without neural pain between the period, 'June to August 2007' were enlisted. All these patients were examined thoroughly based on the classification on the Ridley-Jopling scale. Out of these patients, 60 confirmed borderline tuberculoid (BT) leprosy patients of the age 14 years of age to <60 years were registered under this trial. All the patients were allotted a precoded number, randomly and equally divided into two groups. One group (Group A) was treated with Sulphur in 200c potency in liquid per os once in the week for 2 years. The selection of Sulphur was based on the cardinal sign and symptoms of shown by Tuberculoid leprosy (TT) and BT leprosy patients, mainly sensory loss over the lesion area due to damage of peripheral nerve by M. leprae. The signs and symptoms simulate the indication of sulfur are listed below. Physically, most of the patients are weak, unhealthy and dirty. Mentally they are always found irritable and forgetful. Leprosy is the mother of chronic miasm, psora, so an indication of Sulphur prompted to be selected for the treatment of a tuberculoid type of leprosy cases. The other group (Group B) received PB regimen. This regimen includes Rifampicin 600 mg once monthly and dapsone 100 mg daily for 6 months as recommended by WHO. After registration all the patients were subjected for detail clinical examination and clinical sign were recorded in details by a dermatologist and physiotherapist. During the study, all the patients were subjected for clinical examination every 6 month interval. Slit skin smear was done in each patient of both the groups at the time of registration and at the end of 2 years. To assess the immunological status or cell-mediated immune state in leprosy patients across the spectrum of disease, Lepromin test was carried in each patient of both the groups at the time of registration and at the end of 2 years using Dharmendra antigen, a suspension of defatted leprosy bacilli first reported by Dharmendra. It was further standardized by bacterial count. This antigen evokes an early as well as late reaction with an intradermal dose of 0.1 ml. Early reaction (Fernandez) was read after 48 to 72 hour and late reaction (Mitsuda) after 21 to 28 days of inoculation over the flexor surface of the right forearm. Induration of 5 mm and above with erythema of 10 mm or more was considered as positive. The early responses were graded as erythematous edema doubtful E (<5 mm), 1+ (5-9 mm), 2+ (10-14 mm) and 3+ (15 mm and above). The absence of any response was considered negative. Similarly, late response graded as lack of evident response negative (−ve). Elevation or infiltration 3 o 4 mm doubtful (±) nodule (5 mm) 1+, 5 mm to 10 mm, and 2+, 10 mm above, 3+. For the histopathologic study, using a 6 mm punch, skin biopsy was taken from the edge of the lesional area before the onset of treatment and at the end of treatment. The biopsies were fixed in 10% buffered formalin and processed. Five micron thick paraffin sections were cut and stained with hematoxylin and eosin, modified Fite-Faraco method for demonstration of lepra bacilli in tissue sections. All the biopsies were given coded number and evaluated under a light microscope by three pathologists independently to avoid any bias on interpretation among pre- and post-treatment biopsies. At the end of 2 years, on completion of treatment the code allotted to the patients were disclosed to the investigators and assessor for corroborating the findings of histopathology and immunology study. All the patient were subjected to follow-up study for another period of 2 years. The clinical signs of all the patients are presented in [Table 1]. Single large, well defined hypopigmented, hypoesthetic dry skin lesion was noticed in almost all the patients suggestive of BT leprosy. Single well defined reddish coloured patch with elevated margin present in hand with complete loss of sensation was recorded in some patients [Figure 1]a. The appearance of the patients was, in general, dull and psychological depression was noted in most of the cases [Figure 2]a. More than one lesion was found in 11 cases. These well-defined hypopigmented, dry lesions were found on both hand and/or feet with the complete loss of sensation, perspiration, and hairs. In 6 cases, no nerve involvement was noticed. After treatment, in 96.6% cases, the hypopigmented patch disappeared. The reappearance of normal skin color was gradual. Initially, at the end of 6 months the lesion was found to be less shiny. After 1 year of treatment all the hypopigmented patches nearly disappeared. At the end of 1½ years, the skin regained its normal texture and color and was found almost normal [Figure 1]b. Regain of sensation was recorded. Touch sensation was recovered first, and then pain and gradually heat and cold. The appearance was normal and no dullness or psychological depression was noted [Figure 2]b. The condition of the nerve was normal in all the cases except 2 cases. The subjects of this group showed clinical signs identical to Group A. Single well defined reddish colored patch on hand, feet or any other part of the body was recorded with complete loss of sensation [Figure 3]a. Multiple hypopigmented patches were also found to be present on hand, feet and face with loss of sensation. Muscular atrophy was noticed in 1 case. Involvement of single nerve was recorded in 3 cases. The patients with single well defined reddish colored patch changed into the ill-defined patch with no regain of sensation. Muscular atrophy was present in 1 case. In 6.6% cases, patch almost disappeared without regain of sensation. In 94.6% cases, the hypopigmented, macular, hypoesthetic lesion remained unchanged. The clinical examination undertaken at 6 months period of interval demonstrated no change in the character of the lesion in 94.6% cases [Figure 3]b. No sweating was noted in the lesional area. Single nerve involvement was recorded in 3 cases as recorded at the time of registration. Comparison between Groups A and B in respect of regain of sensation and reappearance of normal skin color are presented in graphical form in Graph 1 [Additional file 1] and Graph 2 [Additional file 2]. Slit skin smear of all patients of both the groups showed the absence of any organism before and after the treatment. Epidermis unremarkable. Dermis showed a focal collection of lymphocytes and macrophages involving perivascular, periappendageal, and perineural spaces. Focal collection of epithelioid cell granulomas with giant cell formation was noticed in the subepidermal region [Figure 4]a. Sweat gland and sebaceous glands were found atrophied in many cases. Nerve fibers appeared swollen and infiltrated by lymphocytes in some cases. In general, epidermis appeared unremarkable. Mild collagenization was noticed in the dermis. In dermis extensive reduction in granuloma sizes were recorded [Figure 4]b. No cellular infiltration around skin appendages was noticed. In some cases cellular collection in the form of a streak noted. After 2 years, epidermis appeared unremarkable. Dermis showed normal appearance with dermal appendages and nerve twigs. No nerve infiltration was seen. Sweat glands and hair follicles were well defined. In some cases, mild collagenization was noticed in the dermis. Sections showed a picture of hyperkeratosis and acanthosis of the epidermis. Dermis showed perineural, intraneural and periappendageal accumulation of macrophage cell and few epithelioid cells in granuloma formation. In 3 cases, multiple granuloma just below the epidermis and in the deep dermis were seen. Flattening of the rete pegs of the epidermis was also noted [Figure 5]a. The presence of acid fast bacilli in the form of clusters and globi all throughout the granuloma was recorded in 1 case. Most of the tissue section showed mild hyperkeratosis, acanthosis of the epidermis. Dermis showed perivascular, periappendegeal and perineural accumulation of lymphocyte and few epitheloid cell in granuloma formation. In other cases, sections showed unremarkable epidermis. In dermis mild perivascular, periappandageal, and perineural lymphocyte accumulation were seen. No granuloma was seen [Figure 5]b. A comparison in respect of two cardinal signs of two study group is presented in [Table 1]. Before treatment almost all patients of Group A standardized Dharmendra antigen lepromin evoked both early (48-72 h) and late (3-4 weeks) skin reactions. After 2 years in a patient of Group A lepromin reaction was found positive in all cases ranging from 13 mm to 21 mm in early. Almost all patients of Group B showed a positive reaction to lepromin (both early and late reaction). After treatment, all the patients of Group B evoked both early and late reaction to lepromin. 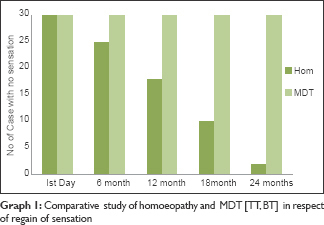 In this study, an attempt was made to compare the efficacy of MDT therapy PB and homoeopathic medicine - Sulphur for treatment of BT leprosy with reference to clinical signs, bacterial index, histopathological and immunological study like lepromin reaction. The study showed that MDT therapy (PB regimen) and homoeopathic medicine were found equally effective as histopathology of skin showed no granulomatous lesion. The lepromin status in both MDT regimen and homoeopathic medicine were same. The most significant clinical sign observed in all cases treated with Sulphur was reappearance of normal skin color and regain of loss of sensation of the skin lesion. 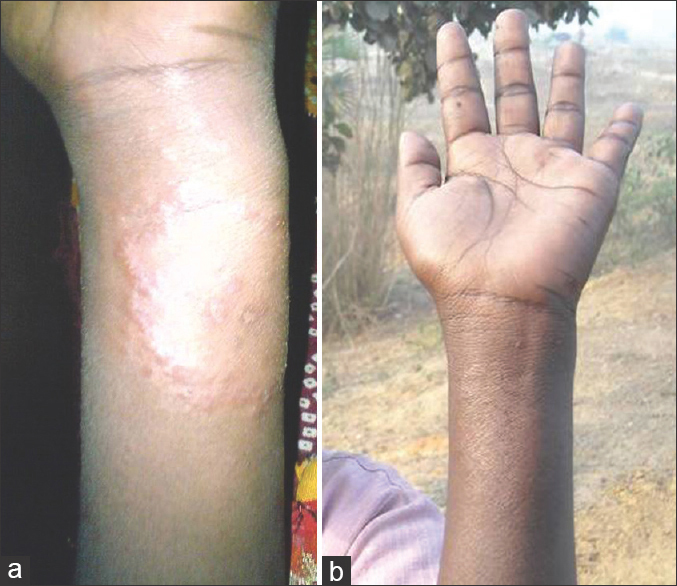 The finding of this study suggested that the homoeopathic treatment may be adopted to treat fresh cases of PB leprosy. This single remedy in Homoeopathy employed in the treatment of PB leprosy can be augmented with MDT. The loss of sensation and loss of normal skin color of the lesion are the chief cause of stigma encountered by leprosy affected person. At present, there is no treatment available for regain of sensory loss. In this study a single medicine, Sulphur used in the treatment of PB leprosy has been found potential to reverse the loss of sensation and loss of normal skin color of the lesion, in addition, to their bactericidal action. We would suggest for further follow-up studies that the finding suggestive of regain of sensation in both PB and MB cases should be compared and objectively documented to get the percentage of regain or any improvement by electromyoneurography and starch iodine testing. Due to lack of resources available, our study lacks confirmation of these histopathological findings of nerve regeneration with Mallory trichrome stain and Congo Red stain with polarizing microscopy. In leprosy, after completion of MDT for 6 months in PB leprosy, clinically most of the patients do not feel cured because of the existence of their skin symptoms for a long time. The hypopigmented and hypoesthetic skin lesion is the root cause of social stigma a leprosy patient encounters though out their life. The patients of PB leprosy could get rid of the skin symptoms if this treatment with Sulphur is also given. This work is a part of a project 'Role of Homoeopathic medicines in up-regulation of host immunity using leprosy disease model' funded Ministry of Health and Family Welfare, Government of India. The authors express thankfulness to the Secretary, Ministry of AYUSH, Government of India for providing fund for the project. The authors are grateful to the Director General, Central Council for Research in Homoeopathy for providing technical guidance. The trial was funded by the Ministry of AYUSH, Government of India under EMR scheme. The authors have obtained appropriate patient consent for the information published in this article. Feenstra P. "Elimination" of leprosy and the need to sustain leprosy services, expectations, predictions and reality. Int J Lepr Other Mycobact Dis 2003;71:248-56. Kumar A, Husain S. The burden of new leprosy cases in India: A population-based survey in two states. ISRN Trop Med 2013;2013: 1-8. NLEP - Progress Report for the Year; 2013-14. Available from: http://www.nlep.nic.in/pdf/Progress%20report%2031 st %20March%202013-14.pdf. [Visited on 2015 Jul 18]. Update on NLEP. Towards Elimination: An Integrated Approach. Bulletin of the Hind Kusht Nibaran Sangh; April-June, 2004. Selvasekar A, Geetha J, Nisha K, Manimozhi N, Jesudasan K, Rao PS. Childhood leprosy in an endemic area. Lepr Rev 1999;70:21-7. Jain S, Reddy RG, Osmani SN, Lockwood DN, Suneetha S. Childhood leprosy in an urban clinic, Hyderabad, India : c0 linical presentation and the role of household contacts. Lepr Rev 2002;73:248-53. World Health Organization. Final Push Strategy to Eliminate Leprosy as a Public Health Problem. Questions and Answers. Geneva: World Health Organization; 2003. Shetty VP, Suchitra K, Uplekar MW, Antia NH. Persistence of Mycobacterium leprae in the peripheral nerve as compared to the skin of multidrug-treated leprosy patients. Lepr Rev 1992;63:329-36. Shetty VP, Wakade A, Antia NH. A high incidence of viable Mycobacterium leprae in post-MDT recurrent lesions in tuberculoid leprosy patients. Lepr Rev 2001;72:337-44. Girdhar BK, Girdhar A, Kumar A. Relapses in multibacillary leprosy patients : e0 ffect of length of therapy. Lepr Rev 2000;71:144-53. Reilly D, Taylor MA, McSharry C, Aitchison T. In homeopathy a placebo response? Lancet 1986;2:881-5. Gibson S, Gibson R. Homeopathy for Everyone. Harmonsworth: Penguin Books Ltd.; 1987. Chakraborty D, Adhikari HK. Leprometous leprosy. Vol. 9. Switzerland: Homoeopathic Links; 1996. p. 7-9. Chakraborty D, Adhikari HK. Curative role of homeopathy in leprosy. J Sci Homeopath 1996;2:48-52. Bellavite P, Lussignoli S, Sernizzi M, Ortolani R, Signorini A. The similia principle. From cellular models to regulation of homeostasis. Br Homeopath J 1997;86:73-85. Rastogi DP, Singh VP, Singh V, Dey SK, Rao K. Homeopathy in HIV infection : a0 trial report of double-blind placebo controlled study. Br Homeopath J 1999;88:49-57. Chakraborty D, Chakraborty T, Das S, Sengupta J. A randomized double blind clinical trial of a homoeopathic medicine in the treatment of traphic ulcer and neuropathy in leprosy. Indian J Res Homoeopathy 2009;3:54-64. 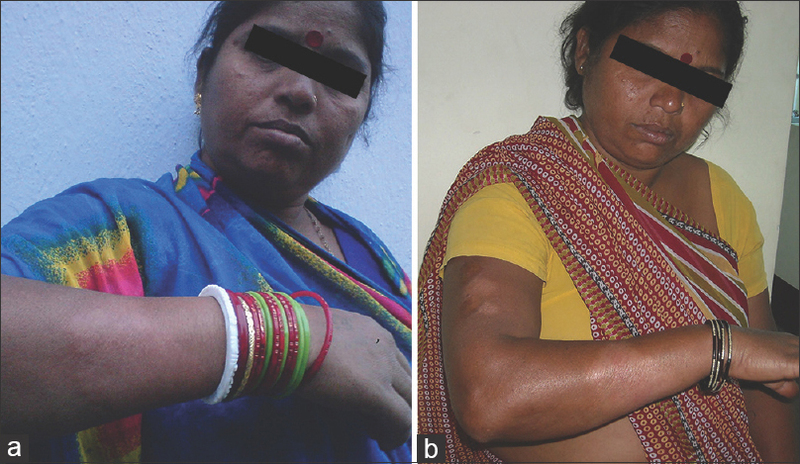 Chakraborty D, Chakraborty T. Treatment of Planter Ulcer in Leprosy. Proceeding of the Asian leprosy Congress, Agra, India; 9-13 November, 2000. Chakraborty D, Dutta S, Chakraborty T. Trail of Homeopathic Medicine in the Prevention of Disability Proceedings of the 16 th International Leprosy Congress, Held in Salvador, Brazil in 4-9 th August, 2002. Reilly D, Taylor MA, Beattie NG, Campbell JH, McSharry C, Aitchison TC, et al. Is evidence for homoeopathy reproducible? Lancet 1994;344:1601-6. Lockwood DN, Kumar B. Treatment of leprosy. BMJ 2004;328:1447-8. Ridley DS, Jopling WH. Classification of leprosy according to immunity. A five-group system. Int J Lepr Other Mycobact Dis 1966;34:255-73. Boericke W. A Pocket Manual of Homoeopathic Materia Medica. 9 th ed. Maryland: Sett Dey and Co.; 1976. p. 620, 622, 632, 634. Dharmendra, editor. The nature of the lepromin reaction. The lepromin test. In: Leprosy. Vol. 2. Bombay: Samant and Company; 1985. p. 999-1061. Sengupta U, Ramu G, Desikan KV. Assessment of Dharmendra antigen. II. Standardisation of the antigens. Lepr India 1979;51:316-22. Becx-Bleumink M, Berhe D. Occurrence of reaction, their diagnosis and management in leprosy patients treated with multidrug therapy; experience in Leprosy Control Program of the All Africa Leprosy and Rehabilitation Training Centre (ALEWRT) in Ethiopia. Int J Lepr 1992;60:173-84. Jopling WH. Leprosy stigma. Lepr Rev 1991;62:1-12. Hastings RC, Ridley DS, Job CK. The pathology of leprosy. In: Hastings RC, editor. Leprosy: Medicine in the Tropics. Edinburgh: Churchill Livingstone; 1985. Palande DD. Nerve involvement in leprosy. Prevention and management of deformities : n0 eed for a paradigm-shift. Lepr Rev 1994;65:161-4. Van Brakel WH, Khawas IB. Nerve damage in leprosy : a0 n epidemiological and clinical study of 396 patients in west Nepal - Part 1. Definitions, methods and frequencies. Lepr Rev 1994;65:204-21. Richardus JH, Finlay KM, Croft RP, Smith WC. Nerve function impairment in leprosy at diagnosis and at completion of MDT : a0 retrospective cohort study of 786 patients in Bangladesh. Lepr Rev 1996;67:297-305. Schreuder PA. The occurrence of reactions and impairments in leprosy : e0 xperience in the leprosy control program of three provinces in northeastern Thailand, 1987-1995 [correction of 1978-1995]. III. Neural and other impairments. Int J Lepr Other Mycobact Dis 1998;66:170-81. Croft RP, Nicholls PG, Richardus JH, Smith WC. Incidence rates of acute nerve function impairment in leprosy : a0 prospective cohort analysis after 24 months (The Bangladesh Acute Nerve Damage Study). Lepr Rev 2000;71:18-33.